Terms Specific to Market Data provided by Euronext (“Euronext”). “Service” means the provision by Vela to Client of Real Time or Delayed Time Euronext Market Data. Client acknowledges that Euronext may at its sole discretion require Vela to discontinue the dissemination of Euronext Market Data to any site for which Client has failed to meet its obligations under this Agreement. 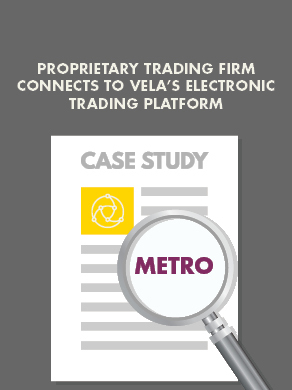 In such cases Euronext must provide 30 (thirty) days’ prior notice of disconnection in writing to Vela and to Client. Client shall be assigned a unique user identification. Such unique user identification may not be used on different Devices nor on the same Device simultaneously. may not delete any copyright or proprietary notice contained in the Euronext Market Data. Client shall not redistribute the Euronext Market Data to any of Client’s group of companies without the prior written consent of Euronext. shall use the Euronext Market Data only for its own internal business use. In case of non-payment or non-compliance by Client with the conditions set out in this Agreement, Vela shall cease disseminating the Euronext Market Data to Client.